The instillation of a cabinet catch is a relatively simple task that solves the problem of cabinet doors opening unintentionally. Cabinet catches come in a variety of designs, some designed to be installed inside the cabinet and some outside. In areas of earthquake danger, using proper cabinet catches is preferred, but in most areas of the country a simple cabinet catch such as a magnetic, double roller or double ball model will do. These designs are intended to be installed inside the cabinet. Follow these steps to install an internal cabinet catch. Determine location of placement. The catch should be installed on the cabinet frame or shelf opposite the hinge side of the door and can either be placed at the top or bottom of the cabinet. The catch can be installed vertically or horizontally. If able, the catch should be located near the door handle. 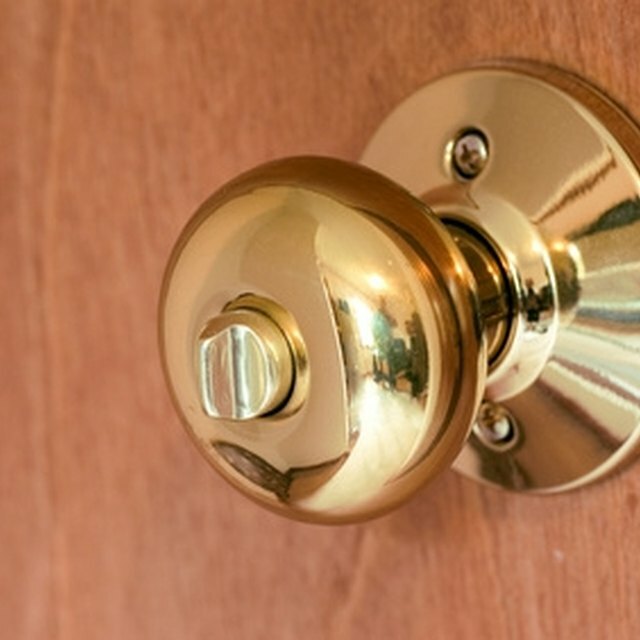 For example, if the handle for the cabinet is on the bottom of the door, then locate the latch at the bottom. This allows you to apply enough force to overcome the latching mechanism. Place the catch in the determined location and mark screw holes with a pencil. Many catches have elongated holes to allow for adjustment after instillation so that a positive catch is made. Remove catch and indent pencil marks with an awl. his will help keep the screws centered and will keep them from slipping when screwing them in. For larger screws, pre-drilling the holes may be needed. Realign the catch with the screw holes and install with the screws supplied by the catch manufacturer. If no screws are supplied, then purchase appropriately sized screws. A hardware store employee can assist you in selecting the correct size of screw. Close the cabinet door and note where the catch meets the door. Place the strike plate on the inside of the door and mark the location of the screw holes with a pencil. Remove the strike plate and use the awl to indent the pencil marks. Realign the strike plate with the pencil holes and screw the strike plate to the door. Close the cabinet door and test the catch mechanism. Make forward or back adjustments to the catch mechanism by loosening the screws slightly and adjusting the location.